The world’s ignorance regarding the health effects of radiation is occasionally incredible. I just came across a story from New Zealand titled Health fears around polar nuke leak that attempted to implicate the Naval Facilities Engineering Command’s PM-3A, a small nuclear plant that supplied heat and electricity to McMurdo Station in Antarctica during the period from 1964-1973, as the root cause of death for a man who passed away in 2010. Let me put this into perspective – the Navy completed its removal and cleanup of PM-3A from the McMurdo Station in Antarctica in 1979. That while I was still in college; I am now a 51 year old grandfather. I have a copy of the final report from the removal; it provides details of the results of the intensive sampling conducted both during operation and after removal. There is no way that the sailor’s disease was caused by exposure to radiation from that plant. I devoted an entire issue of the original Atomic Insights to the PM-3A that powered McMurdo. The article about the removal operation was titled How clean is clean? Blasting out frozen soil. Apparently, the old sailor who passed away could not deal with the fact that many people in his generation – and in every generation – will die from cancer. He apparently spent a lot of time trying to convince the VA that it was the nuclear plant at McMurdo that must have caused his cancer. That disease is responsible for about 30% of all human fatalities each year. It would not be surprising for people who served in remote stations while in the armed forces during the period from the 1940s-1990s to notice that their service buddies seemed to be affected at a higher rate than the general public. That particular segment of the population had a very high portion of cigarette smokers. That was an era when cigarettes were added to ration kits, when they were sold in commissaries for low, tax free prices, when one of the few sources of relief from the stresses of boot camp came when the platoon leader said “smoke if you got em”, and when cigarettes were a reliable form of barter. Things were different by the middle of my navy career, but I will never forget the experience of attending training sessions in the crew’s mess of a submerged submarine in the early 1980s and having the ash tray on the table be filled to overflowing by the end of the hour long session. It is not terribly surprising that some medical professionals might mistake the type of cancer caused by smoking for the types of cancer attributed to high doses of radiation – heavy smokers can be guilty of giving themselves internal radiation doses far in excess of what would be allowed for a radiation worker. 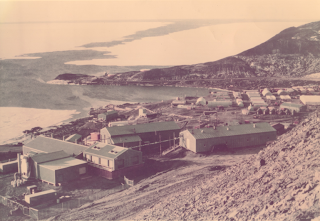 Corrected: (March 8, 2011) A retired Radioman Chief Petty Officer who served at McMurdo Station during three winters contacted me to inform me that I was mistaken when I referred to the PM-3A an Army plant. All of his officers in charge were Naval officers, he was in the Navy and most of the operators were in the Navy. I did some additional research. The PM-3A was built for the Atomic Energy Commission (AEC) by the Martin Company as a part of a branch that provided engineering support for the Department of Defense. The branch is often better known as the Army Nuclear Power Program, but it built reactors for other services when they needed systems similar to those used by the Army. PM-3A was a Navy project funded by the Naval Facilities Engineering Command (NAVFACENGCOM), which had responsibility for providing shore based power to the research stations in Antarctica. It was not a ship propulsion plant and not assigned to the Naval Sea Systems Command nuclear power branch (NAVSEA-08) that is better known as Naval Reactors. That story had some inconsistencies on the technical side. It said, “It was fuelled by strontium-90 pellets, an unusual few because of their high radioactivity levels.” So I was a little confused. They must have mixed up an RTG filled with strontium titanate like the ones the Russians make. I spent a number of days at “McMudhole” in 1974 and 1975 on my way to and from a research project on the Ross Ice Shelf. Besides the smoking, I also noticed quite a bit of alcohol consumption (in which I also took part). It would not surprise me if there were also a contributing factors, especially when combined with smoking (in which I did not take part). Oddly, there are similar stories around here. At one of the first public meetings that I attended about Vermont Yankee, years before I started blogging, a woman came up to testify. She explained that she had moved to the Brattleboro area thirty years before. At that time, she and all of her friends were healthy. Now, thirty years later, many of them were getting sick “because of living near that reactor.” The number of different types of illnesses (I remember cancer and autoimmune diseases) ascribed to “that reactor” was legion. It never seemed to occur to her that if she and her friends were in their twenties and early thirties –thirty years ago–they were now older and more likely to get sick. No, it was “that reactor” that did it! You missed this particular source on Nukey Poo in your Atomic Insights coverage (Bulletin of Atomic Scientists). Discusses the many challenges of building a nuclear reactor in Antarctica: shipment by C130 Hercules aircraft, siting (at frost line), inability to build concrete containment vessel (use of gravel backfill instead), management issues surrounding radioactivity seepage and argon-41, distilling sea water and melted snow (gathered from miles) for steam generators, hydrogen fire in containment tanks and eight week shutdown (requiring diesel back-up), plans for second reactor cancelled (“unless there is some miraculous breakthrough with a plant that needs hardly anyone to maintain it”), shutdown earlier than anticipated after 11 years (unclear the reason), removal plan for PM-3A (3 years), and more. I was unaware of this facet of arctic/antarctic exploration (something that interests me a great deal). Energy challenges in extreme environments, and this particular failed experiment, sounds like a worthy topic for a book. Hyperion – Uranium Hydride system would match this perfectly. Thanks for this. The Russians are certainly giving it a try. I travel a lot in the arctic, and runaway oil prices and tight supplies are a huge concern. Fuel subsidies consume 20% of the budget in Nunavut. @Guest – Hyperion is no longer planning on uranium hydride for its first generation. They shifted to uranium nitride several years ago. Their reactor also produces about 6-7 times as much thermal energy as the PM-3A, which produced just 11.3 Megawatts thermal. We reap what we sow. Governments in the US, the UK, and Canada (in cases that I know of) are facing claims from vets from being exposed to radiation during service. In Canada, some vet is at this moment insisting he is sick due to a posting in Afghanistan in an area with high levels of DU from previous action. What we have to understand is that these same governments have brought this on themselves with their acceptance of the LNT hypothesis. They can’t have it both ways.